The first track of World Mountain Bike Orienteering Championship has been mapped. To follow it, for this time, it is not necessary to be a runner or a biker, but just to be interested in art and design and willing to know through Arts a sport which will be the big character of Vicenza district nest August 2011. The path is that of the itinerant exhibition of the 20 best projects competing to the concourse "Eismann - Arte per Passione", intended to World Orienteering Championship. Half were selected by a panel of specialists, half were sorted through the internet, and they can be admired in the exhibition centre of ViArt in contrà del Monte, 13 Vicenza, between Piazza dei Signori and corso Palladio. "A central place of the city - Gabriele Viale, event director of the World Championship, notices - which symbolizes that the exhibition starts from the heart of Vicenza and will touch the whole district, from Bassano to Noventa, passing through the most suggestive sites. We describe orienteering by images, since we would like this sport, still not very popular, to get to citizens before August, when the best bikers will compete on our territory." Last 16th December Giovanni Paolino, Eismann Italia chief executive, opened the showroom, officially starting the exhibition and the countdown for the World Championship. The works will stay at ViArt until 9th January in this opening times: Tuesday to Friday 15.30/19.30, Saturday and Sunday 10.00/12.30 and 15.30/19.30. The stage schedule for the next semester is not ultimated yet, but the exhibition will be hosted for sure at Bassano del Grappa (Museo Civico), Lugo Vicentino (Villa Godi Malinverni), Marostica (Sala del Castello), Sossano (Palazzo Municipale), Alonte (Palazzo Municipale), Lonigo (Palazzo Pisani o Palazzo del Vino), Montecchio Maggiore (Galleria Civica), Noventa Vicentina (Villa Barberigo), Sarego (Palazzo Municipale), Zugliano (Villa Giusti Suman), Brendola (Golf Club). 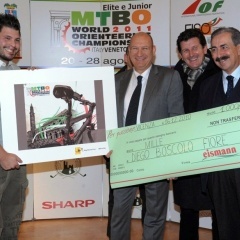 It will be back at ViArt from 17th to 28th August 2011, in conjunction with the World Championship.